Home > Non Invasive Tests > What Are Cardiac Biomarkers? Cardiac biomarkers are molecules that are released into the blood when there is something wrong with the heart. When something goes wrong, like a heart attack, or even angina, the heart muscle is put under great stress and the heart muscle fibres release molecules that are never normally produced. These get into the blood and can be detected in a blood test. The more of a stress molecule that is detected, the more serious the underlying heart condition is likely to be. If someone is showing symptoms of acute coronary syndrome – the technical terms for a suspected heart attack, one of the first things that happens on admittance to hospital is that blood samples are taken and follow up samples are then taken at regular intervals. The results of what cardiac biomarkers are present, how much of them are present and how they are changing can provide the medical team with much useful information. It is crucial that the results of cardiac biomarker tests are obtained as quickly as possible so that the patient can be treated for the seriousness of their condition. Many cardiac biomarker tests are available as point of care tests – which means that the equipment and procedure is available in the patient’s room. Point of care tests are usually set within a trolley system that can be moved directly to the patient’s bedside to allow quick and regular monitoring of how they are doing. One of the most important cardiac biomarkers is troponin. This molecule is released when heart muscle fibres die and release the proteins that make up their structure. Troponin is never normally detected in the blood – if it is there it means there has been substantial heart muscle damage and high troponin levels are closely correlated with the severity of a heart attack. Other heart biomarkers tend not to be quite so specific; they are also released if skeletal muscle is damaged, or if there is a problem with either the kidneys or the liver. 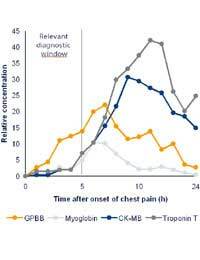 Another commonly used cardiac biomarker is creatine Kinase-MB (CK-MB). Creatine kinase is a protein that acts as an enzyme and it is made and used only in heart muscle; it is not present in skeletal muscle or in the smooth muscle in the intestines. When heart muscle suffers disruption, the contents of the heart muscle cells are released into the blood and blood levels of CK-MB rise. Other biomarkers used include aspartate aminotransferase (AST), lactate dehydrogenase and myoglobin, the form of haemoglobin that acts as an oxygen carrier molecule in heart muscle. Different molecules build up in the blood at different times after heart muscle has been damaged by a heart attack. Although troponin is one of the most useful cardiac biomarkers generally, it is difficult to detect during the first few hours after symptoms such as chest pain and breathlessness have started. Research has shown that another biomarker is very useful in the first four hours after a heart attack. Heart-type fatty acid binding protein (H-FABP) is released very quickly into the blood stream when heart muscle dies – and increased levels can be detected by a blood test within an hour. The level of H-FABP is at its greatest 4 hours after a heart attack, and then it falls away again. By then, it has been extremely useful and the job of monitoring the blood for other cardiac biomarker switches to troponin. Since cardiac biomarkers were discovered and tests have been developed to detect them in heart patients, this has proved incredibly valuable for the medical team managing a busy cardiac unit. By combining information from cardiac biomarker tests with results from electrocardiograms (ECGs) and clinical assessment of symptoms, doctors can diagnose a heart attack much more quickly and start the correct treatment hours earlier. This can be life saving in many cases. Research is now active in biomarker research both in cardiac medicine and in other branches of medicine such as cancer. The ideal cancer biomarker would be a molecule that is released into the blood in large enough amounts to be detected easily when the cancer has only just started to develop. Cancer biomarkers could make earlier treatment possible for the many tumours that claim lives because they remain undetected until they are so advanced that curative treatment is impossible.